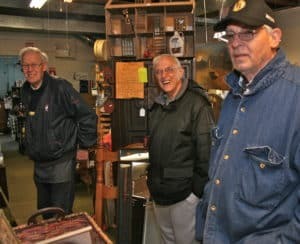 In 2009, the Easton Lions Club and Easton Grange opened up a Thrift Store in the old Grange hall on Route 138. The Grange is located at the corner of Route 138 and Elm Street next to Union Villa Pizza and Bob’s Ski Doo in North Easton. The Thrift Store is a fantastic place to pick up items for your home or college dorm room, from housewares and furniture to toys and tools. 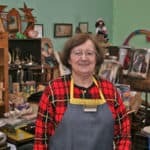 The Easton Thrift Store in the Grange is open year round every Wednesday from 10 AM to 2 PM and Saturday from 9 AM to 3 PM. Stop by and say “Hi” to the friendly Lions volunteers and pick up some great items at great prices. On March 30, 1892 under the direction of Deputy Elbridge Cushman, thirty people signed the charter which formed the Easton Grange #196 P of H. It was approved by the National and State granges and became effective April 8, 1892. Perhaps it was fitting that William N. Howard was the first to sign the charter as during his years of being a Deputy he organized sixty two Granges. He was the third Master of Easton Grange (Willis R. Drew being the first). In 1897 he started a long term as Secretary of the Mass State Grange and in 1925-1929 he served as State Master. He was the first of two Easton Grange members, thus far, to attain this high honor. The second being Kenneth B. Skinner who served in 1985 – 89. At first the Grange met in what was called the Bank Hall and paid $1.00 for each meeting. The Bank Hall was a small building located between 159 and 169 Washington St., North Easton, the foundation of which can still be found there. It didn’t take the Grange long to outgrow this small building. In 1894 a lot of land at the corner of Washington and Elm Sts. Owned by David B. Tinkham, and Easton Grange member was offered to the Grange for $250.00. In order to purchase the land and build, the Grange voted to form a corporation, the charter of which was signed on June 28, 1894 in the State House in Boston. Bids were put out to build a hall of certain specifications, such as rubblestone for the foundation, and the cost not to exceed $2500.00. The contract was awarded to George H. Dewitt, also an Easton Grange member, who agreed to build it for $1,711.13. Shares were sold to members to cover the cost. Suppers and Fairs were also held to raise money. A mortgage was taken out at a Rockland Bank on April 6, 1897 and was paid off in 1944. Some of the work was done by Grange members such as the grading and painting. A furnace was installed by E.E. Kelley & Co. at a cost of $262.00 and served the Grange over 60 years. Two different oil burners have been installed since then, one in 1959 and the other in 1982. As there were no electric lights, four hanging lamps at a cost of $4.75 each along with seven Bracket lamps at a cost of $3.75 each were used to light the hall. We are proud to boast that we are still using the one hundred original chairs costing .375 cents each and twelve settees costing $5.30 each. We guess we got our moneys worth. Over the last one hundred years money has been earned to make improvements to modernize the building such as electricity and rest rooms and to help keep the hall in repair.During its one hundred years of existence, Easton Grange has been very active. Since its very beginning right through to the present time, suppers and whist parties have helped to sustain us. Many hours, along with a lot of fund, have been spent in the production of plays, minstrel and variety shows. Some of these were held at the old Oliver Ames High School as our hall was not large enough to accommodate the audiences. One year a Fashion show was held at the Walk Over Club in Brockton. 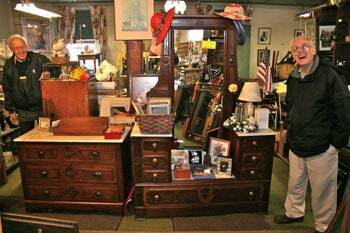 We have also had good times running auctions, Flea Markets, Craft Shows, Rummage and yard sales. At one time the members put on a circus which proved so successful it was in demand at the other granges for their programs. One of the biggest events ever held in Unionville, which is what the section of Easton where our hall is located used to be called, was a three day carnival which we held on what is now a playground near the Hall. Through the years Easton Grange has helped to beautify the town. For several years we tended to the upkeep of the cemetery across the street from the Grange hall. We have planted flowers in front of the town hall and trees in the center of town. Last year we planted flowers in front of the World War 1 Monument at the Old Unionville School House on Washington Street. For the past 5 years we have presented a Citizenship Award to an outstanding citizen of the community. We have held Halloween parties for the neighborhood children. We helped celebrate the Mass Tercentennial Day back in 1930 and the 250th Ann’v of the Town of Easton in 1975 and more recently joined in the Welcome Home Parade for those who served in the Persian Gulf. We sponsored a Junior Grange from Jan. 1959 until March 1980. Back in the days when each Sat. morning you could turn to the Grange Program on Radio Station WBET, Easton Grange was a featured regular. Many Blue Ribbons have been received by entering Grange Exhibits in Major Fairs in this area and, of course, we have our own Agricultural Fair each year complete with a corned beef and cabbage supper. This year the Fair will be held on Aug. 22 and we hope to see you all again at that time.